Epok epok is Malay style semosa. 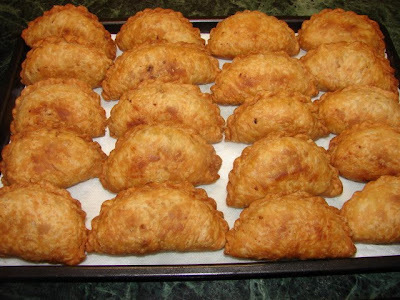 Some people called them karipap. Epok epok is similar to Chinese-Malay style flaky curry puff, the only difference is the pastry. Epok epok is usually deep fried. For the filling, some like sardine which I am not too keen. Some people used chopped hard boiled egg with potato. Chinese yam is also a common filling. Vegetarian version includes potato and vegetables like carrot and peas. I like curried flavoured potato with meat. The pastry is much simpler than flaky curry puff. This pastry is soft yet very forgiving. If there is mistake or hole made can be easily patched up. This recipe makes about 30 pieces. Finely diced the potato. Rinse to remove starch then drain thoroughly. Chop the onion. Heat oil and fry onion till softened, add curry powder, chilli powder and sambal. Stir fry till fragrant. Add beef continue stir frying till beef turned brown. Then add in the potato and stir fry for about 5 - 6 minutes at medium heat till potato is almost cooked. Season with salt and chicken stock powder. Remove and leave to cool completely. Make the dough. First rub the fat into the flour. Then mix in the salt and sugar. Slowly add enough water and mix with a fork or chopstick till the dough is formed to a lump. No need to knead. Just leave the dough to rest for 20 - 30 minutes. Cut the dough into half and roll into a 1 inch thick sausage shape and cut equally into 30 pieces +/- 1 altogether. Coat the dough with flour, then roll it out into an oval shape, add filling, pinch to seal the edge. If needed a touch of water can be used to dampen the edge helping it to seal. Then crimp the edge. Continue doing step 5 till all the dough pieces are wrapped. Heat about 700ml of cooking oil till hot, turn the heat to medium low. Gently add the epok epok into the hot oil. Deep fry 8 - 10 pieces at a time till golden, turning a few times during frying. If the oil is too hot turn the heat down a bit. When browned the pastry becomes quite hard and crispy. If there are any left over can keep in the fridge for few days or frozen. Reheat in oven.